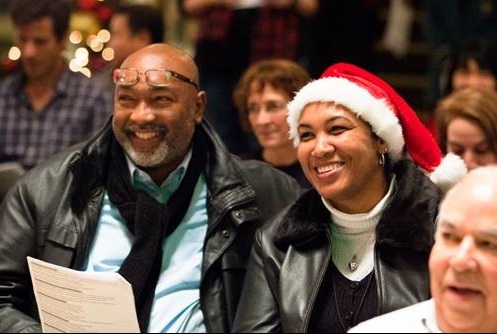 Go Metro Weekends, the Joy of Christmas in Downtown L.A.
Photo via Music Center Official Facebook. Believe it or not, Christmas is right around the corner! And although we won’t get snowfall or freezing temperatures, there are plenty of seasonal celebrations to keep you and your family in the holiday spirit. Choose from any of the following events happening this weekend in the heart of Los Angeles, just steps from Metro Rail. If you like singing Christmas carols, belt out your favorite holiday tunes during the The Music Center’s annual Holiday Sing-Along this Friday from 6:30 p.m. to 8 p.m. If you can’t remember the words to every song, don’t worry! Free lyric sheets will be provided, plus a live accompaniment as your background in case you’re a little rusty. Admission is also free, however, tickets are required. Hear festive holiday favorites from leading concert organist David Higgs during the Walt Disney Concert Hall Organ Spectacular. The program begins this Friday at 8 p.m.
See Debbie Allen’s The Hot Chocolate Nutcracker starring Raven Symoné on the Dorothy Pavilion Stage at 7:30 p.m. Friday night or Saturday at 1 p.m. or 7 p.m. Ticket prices start at $54. The Walt Disney Concert Hall’s Holiday Sing-Along is this Saturday at 11:30 a.m. and 2:30 p.m. Throughout both performances, the concert hall’s pipe organ will be accompanied by a choir and jazz duo. Enjoy a pre-concert winter wonderland party before each show with free chocolate and a photo with Santa! The Los Angeles Ballet: The Nutcracker, all weekend at UCLA’s Royce Hall. Metro Bus 2/302 to Hilgard/Wyton or Santa Monica Big Blue Bus to UCLA Terminal at Hilgard/Stathmore. Blue Line resuming normal service with residual delays through 6:30 p.m.